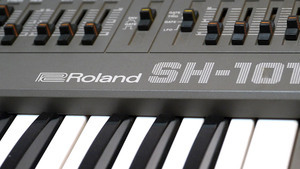 KitMonsters – Roland SH-101. The music makers’ guide to making music. 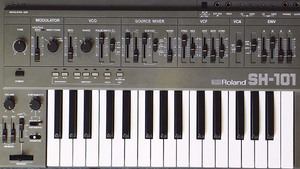 Roland SH-101 is a synthesizer from the early 1980s, manufactured by Roland. 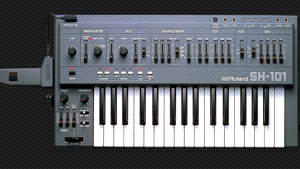 It is a small, 32 key, monophonic analog synthesizer. It features one oscillator with 3 simultaneous waveforms, an ‘octave-divided’ square sub-oscillator, triangle and square/pwm waveform. It has a low-pass filter/VCF capable of self oscillation. The self oscillation filter can be used to make bassdrum sounds. The controls are simple to use as there is a slider or switch available for every single parameter, and there is an external trigger input to control the speed of the sequencer or the arpeggiator. The LFO is very fast and can be used to make fast arpeggios with decay down to zero volume, without retriggering the ADSR. External control is achieved using CV/Gate and not MIDI (as is the case with many older synths), but MIDI to CV/Gate converters are readily available from third-party companies such as Kenton Electronics. 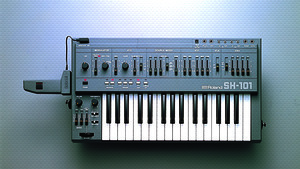 The SH-101 was produced in at least three colors: gray, blue, and red: there was also a very limited run of white. A shoulder strap can be connected to it, and a small handgrip can be plugged into the side which contains a pitch bend wheel and a pitch modulation trigger. When slung over the shoulder it doubles as a “keytar”.